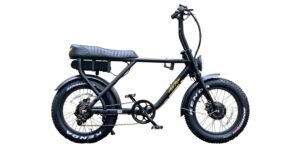 Kenda Small Block Eight, 26" x 2.35"
The latest Volton Alation electric bike builds on what has worked for Volton over the past several years (a mid-priced, powerful ebike with clean battery integration) but improves frame balance, efficiency and climbing power with a Bafang Max Drive mid-motor vs. a hub motor or older bolt-on BBS02 motor. The Max Drive looks a lot more polished and in my experience offers excellent power without producing much noise. 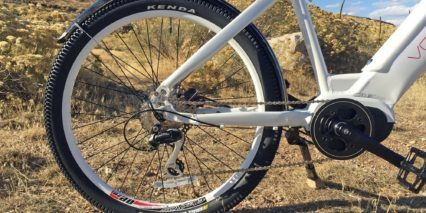 While the diamond frame version of this bike (which comes with either a 24″ or regular sized 26″ wheel) is on par with many competing bikes I found the step-thru model to be unique and exciting because it opens up trail riding to petite riders in a way that inspires confidence. 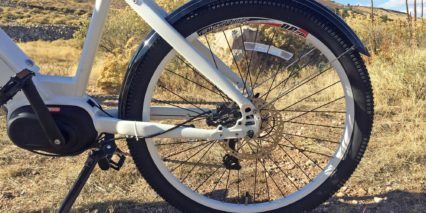 This model also comes in the 24″ or 26″ wheel size as well as several fun colors but doesn’t skimp on power. 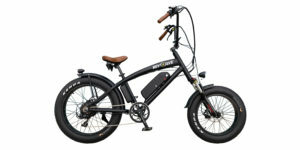 The battery is just slightly smaller (in order to fit in the smaller frame) but otherwise it’s basically the same bike. 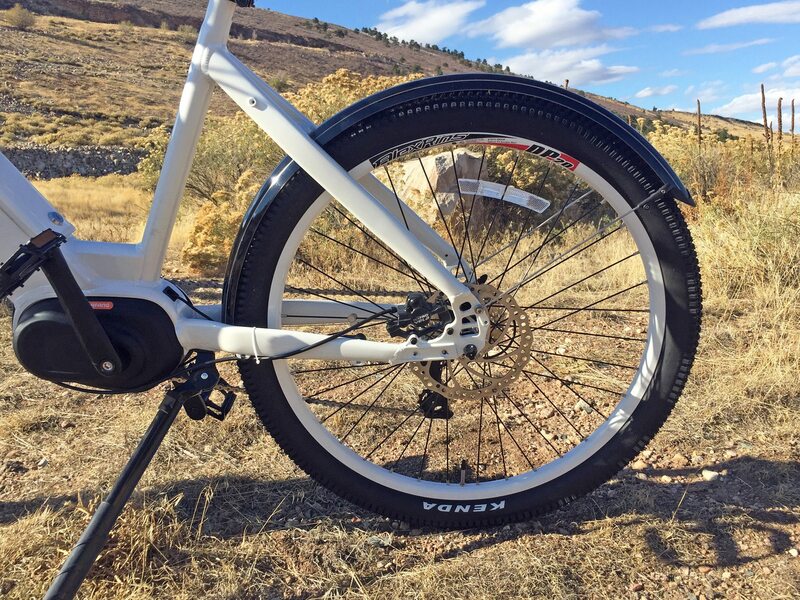 Trade-offs with most step-thru bikes include a flexier feeling frame and often more limited bicycle rack mounting options… thankfully the battery and both wheels are removable. 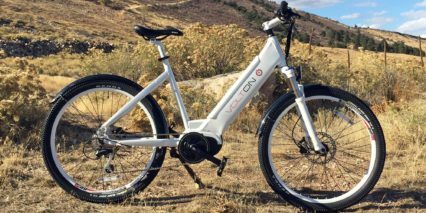 I tested this e-bike with lots of help from my girlfriend who is ~5’2″ and an avid pedal-power mountain biker. 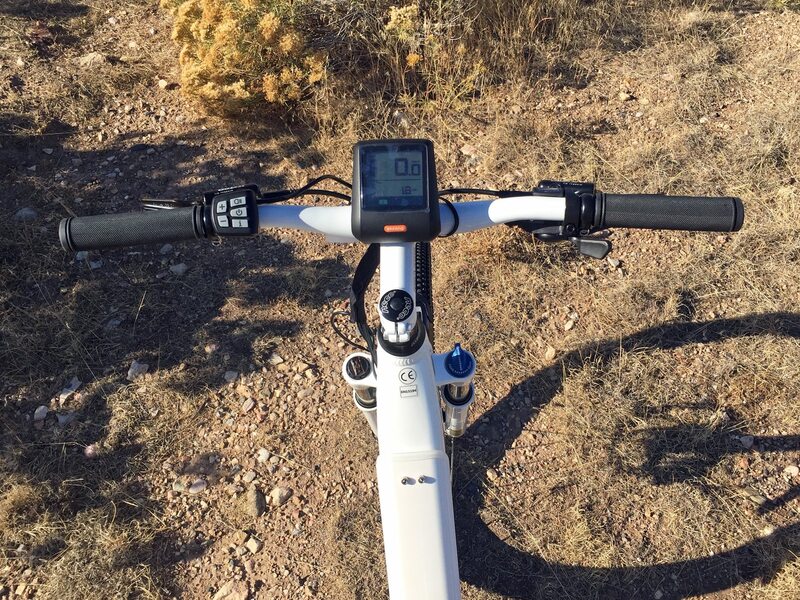 At first the weigh of the bike was a question mark and the lack of bottle cages, clunky kickstand and rattly fenders gave us pause. 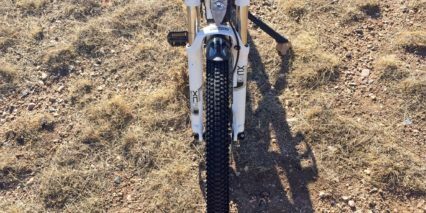 The first half of the review above was filmed with the fenders still attached but for mountain biking applications you’d be well served to take them off immediately. 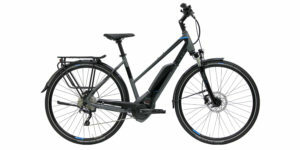 That’s the thing about this bike, it’s really well rounded and would work for neighborhood riding in the rain, high speed 28 mph commuting in the city if you added a rack or trail and light mountain riding as we did. There just aren’t a lot of bikes out there that let you jump right off onto both feet with no problem. 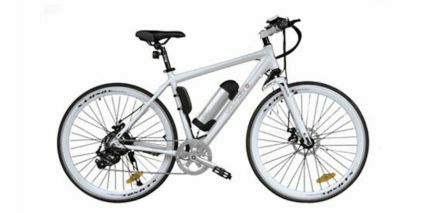 Furthering this sense of control and confidence are the powerful and easy to use 180 mm hydraulic disc brakes. 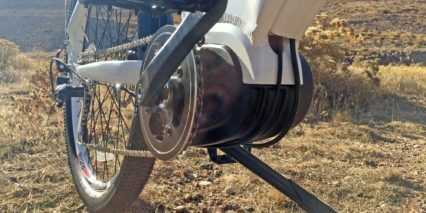 For riders with smaller hands and less muscular forearms and fingers these brakes are a real blessing. 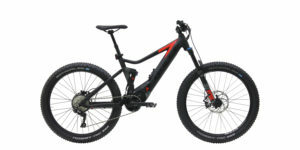 Keep in mind… you can pay a lot more for e-mountain bikes with adjustable length levers and lighter weight air forks and shift sensing and 203 mm rotors etc. etc. but most of those aren’t truly step-thru’s like this even if they are marketed to petite riders and they all cost a lot more. 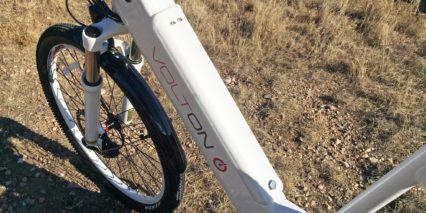 Volton is maintaining that balance of value and while I wouldn’t call this bike cheap at $2,649 it is certainly justifying the price with a lot of upgraded components and custom frame. A few gripes I have to mention are how tricky it was to get the battery pack out due to the canvas bag it’s mounted in. 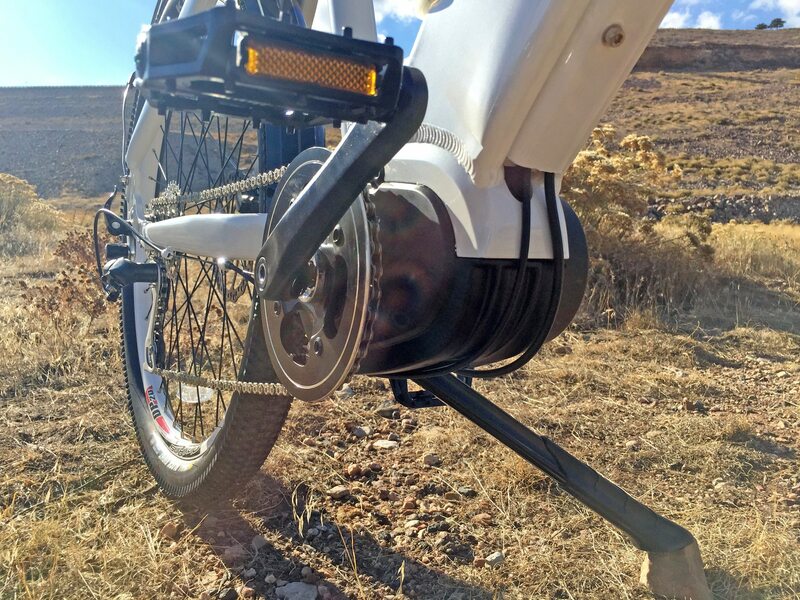 This made it tight (reducing rattling) but the handle started to tear after taking it out and putting it back a few times and even with my knowledge of how to do it correctly… it took more time than other e-bikes I’ve tested. The battery is low, centered and completely hidden in the frame. The cover locks for security but is just made of plastic so maybe not as confidence inspiring as some other designs. The cover also didn’t sit perfectly flush and tight with the tubing so I believe that in heavy rain some water would get in. That’s not a huge issue as the pack itself is sealed in a metal box but the bag and wires might get a little wet. 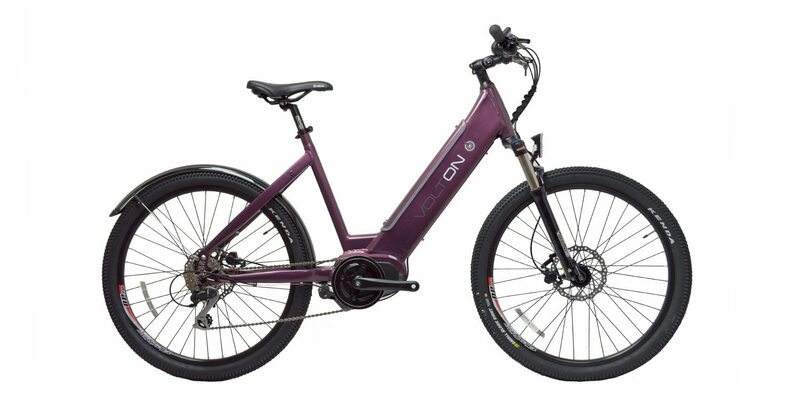 At ~7.1 lbs the battery can be charged on or off the bike and is nice to take off if you’re lifting like for a car rack but I think I’d prefer to just leave it in given the hassle. 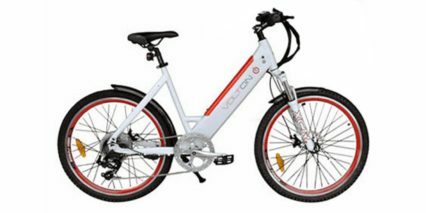 Once charged up, activating the bike is easy and clear thanks to a multi-button control pad positioned near the left grip. Just hold the power button then press + or – to change assist levels. 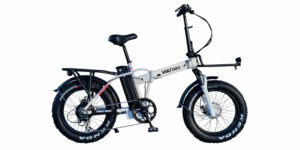 You can go all the way to zero and use the battery just to power the computer display showing speed, range and odometer readouts as well as the headlight or you can arrow up to level 5 for maximum power and speed. Note that by unlocking the display (double tap the “i” button then use +, – and i to navigate) you can change the top speed and adjust other settings. 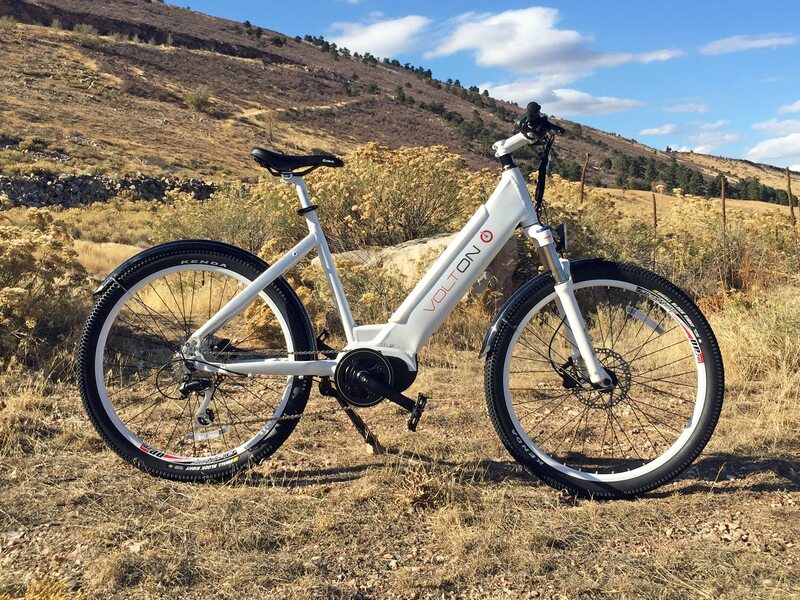 The maximum speed is 28 mph but we tested at 20 while trail riding to perform as a Class 1 ebike for legal reasons. 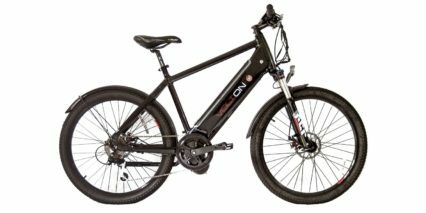 In the parking lot, I was able to hit the top speed by shifting to the highest gear and using level 5 assist and I was really impressed with the power and how quiet, smooth and responsive the motor was. 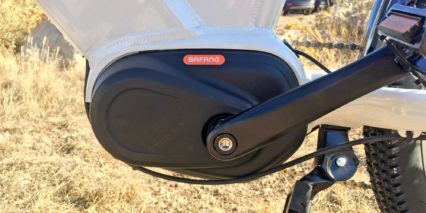 I’m sure we will see more ebikes using the Bafang Maxdrive and they will probably cost more due to the custom interface with bike frames vs. bottom bracket adapter… but to me it was worth it. 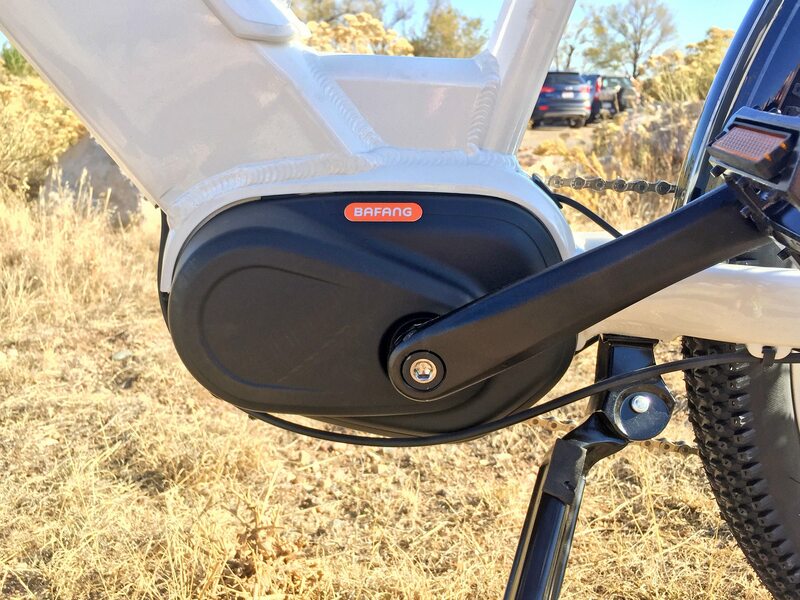 The motor combined with the battery design on this bike made for a clean, stealthy ride that would perform well in a whole range of environments. My girlfriend had a blast and really came away glowing, convinced that the step-thru was worth it because she wasn’t so worried about landing on her crotch or hanging one leg up and crashing (which has happened several times on her regular women’s specific Specialized mountain bike). 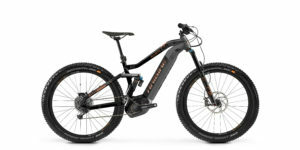 For guys and girls alike I could see this bike being fun and capable. 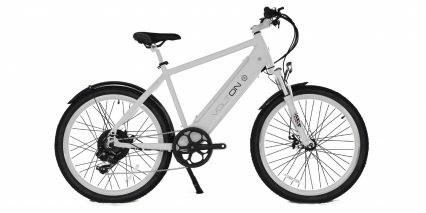 I’d probably opt for the high-step myself and liked the bright white color option for improved visibility and reflection at night. 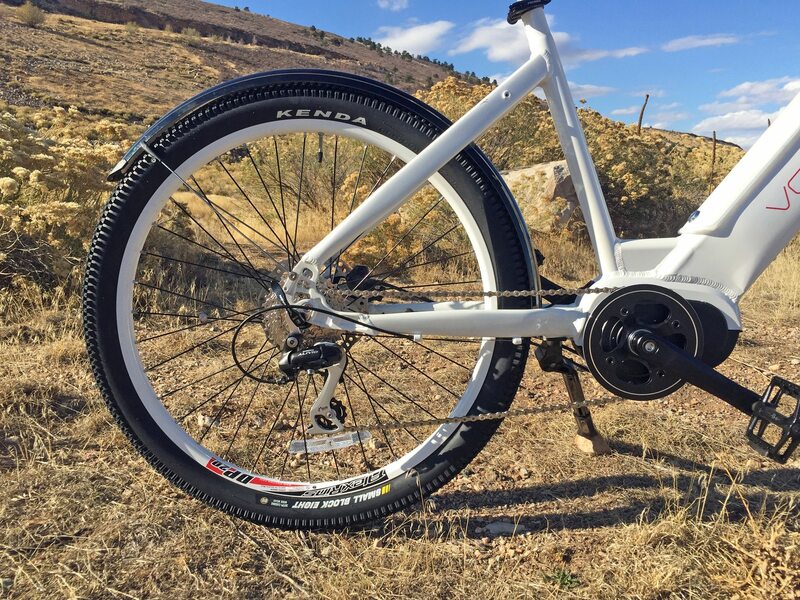 I’d probably also add a rack and keep the fenders on… even then I think smooth trails would be fine but given the rocks and bumps we hit during the test, the fenders just got in the way. 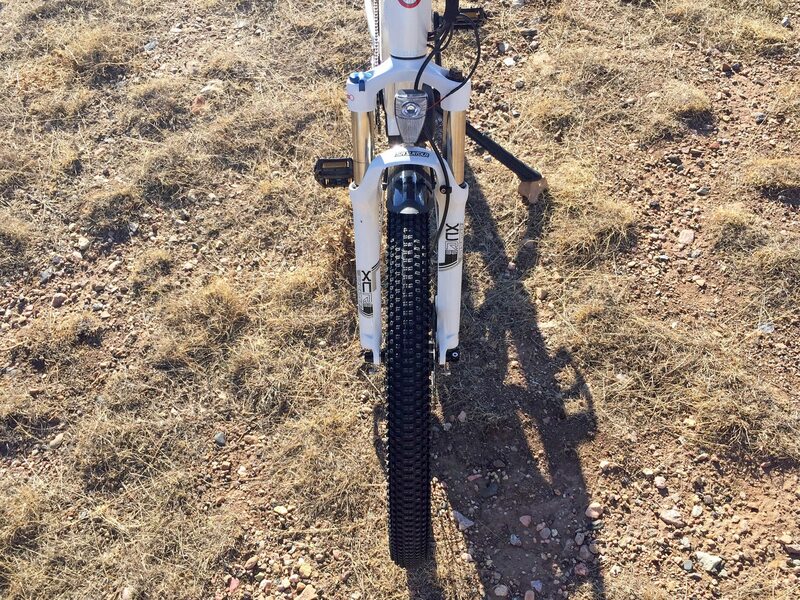 I would love to see water bottle cage bosses and a rear mounted kickstand in the future and have heard that the high-step frames come with an adjustable stem vs. fixed which might be worth swapping for rigid if you like to mountain bike so it won’t come loose. 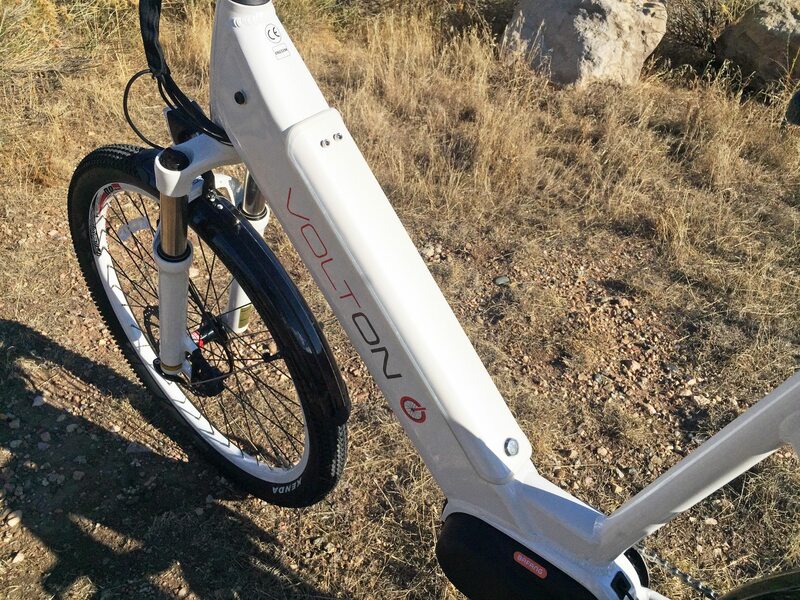 Big thanks to Volton for partnering with me for this review. Distance remaining: I have the MM G330.250. 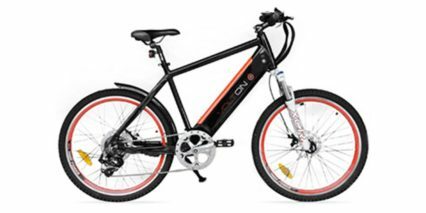 The battery level shows charge remaining, it shows in real time so you can see how far you can go in each assist level under the style of cycling you are doing. 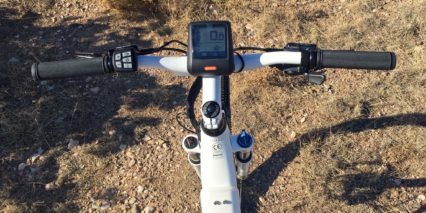 I can get 100km on assist level 1 cycling in the correct gear, so I know each bar represents 10km to me with my 35v,11.6Ah.